Acquired by Littelfuse in 2017, U.S. Sensor Corp.® is a world class manufacturer of an extensive variety of the highest quality NTC thermistors as well as thermistor probes and assemblies. The company’s products are produced using proprietary state of the art processing techniques which results in excellent long-term reliability. Product line also includes Thin Film Platinum RTDs and RTD assemblies. 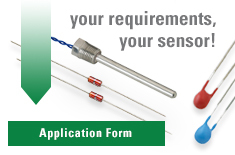 Customers world-wide use U.S. Sensor thermistors and RTDs in their most demanding applications. To assure that U.S. Sensor maintains its competitive position in the market place and continues to provide products which exceed its customers specified requirements, the company continues to make substantial investments in the most advanced component manufacturing equipment as well as in research and development of innovative products and manufacturing processes. U.S. Sensor Corp.® manufactures thermistors by preparing precise formulations of powdered transition metal oxides "doped" with stabilizing agents. These compounds are combined with binder materials and processed using proprietary techniques resulting in superior quality components and assemblies. U.S. Sensor's application engineering personnel are highly trained professionals who will assist you to select a standard thermistor or design a special device for your most exacting requirement. Whether your application requires a simple component, a probe assembly or a complex network which will exhibit nonstandard resistance temperature characteristics particularly suited to your requirements, our application engineering personnel will be most helpful. U.S. Sensor personnel have been designing unique devices for the most demanding applications for more than thirty years. SPC (statistical process control) techniques are used throughout the manufacturing processes in an endless loop of quality improvement. Total Quality Management is our pledge. U.S. Sensor manufactures thermistors using sophisticated state of the art processing techniques. Their excellent long-term stability coupled with precision interchangeability and low cost makes them ideally suited for temperature sensing applications. The devices are available in a wide variety of styles designed to suit countless circuit requirements. NTC thermistors are manufactured using homogeneous compounds of various metal oxides including Manganese, Nickel, Cobalt and Copper. The powdered metal oxides, along with stabilizing agents and organic binders, are combined into exact formulations which will exhibit certain electrical characteristics upon completion of the manufacturing processes. Dependent upon the particular application for which the devices are to be used, the oxide/binder formulation is formed into any number of shapes including chips, discs, wafers and bars. Precision interchangeable thermistors used for temperature measurement and control as well as glass encapsulated and surface mount devices typically utilize a small chip thermistor sensing element. A slurry, consisting of the metal oxide compounds and special organic binders, is "cast" onto a flat surface to exacting dimensions. The thickness of the "cast tape" can be as thin as 0.001" or as thick as .050" depending upon the application. The "cast tape" ware is "blanked" into wafers or substrates of a suitable size. The "green" wafers are sintered at high temperature and electroded with silver or other electrode materials. The electroded wafers are diced into the exact size dictated by the particular application. A typical wafer will yield from 2,000 to 20,000 devices depending upon the size of the chips required. The chips are tested electrically, lead wires are attached, resistance trimming is performed if necessary and an encapsulant is applied. In some applications, the "unleaded" bare chip can be used "as is". Chips can also be encapsulated in a hermetically sealed (DO-35) style leaded glass package or into a "MELF" style surface mount package. For production of large disc thermistors as well as power thermistors, those devices used primarily for inrush current limiting in switching mode power supplies, discs ranging in size from 0.200" diameter to over 1.000" diameter are formed from the oxide/binder formulation using a tabletting press. Precise quantities of powder are automatically metered into a die cavity and compacted into a shape which conforms to the specified dimensional characteristics. This process results in uniform density throughout the device as well as uniform electrical characteristics throughout the production run. The "green" discs are then subjected to a high temperature sintering process which will result in the device achieving the desired resistance versus temperature characteristics. The "sintered" discs are then metallized. A thick film silver electrode material is applied to the "flats" of the discs and fired to allow for subsequent electrical contact to the device. Testing of the thermistor's electrical characteristics is performed to confirm that the devices conform to the desired resistance versus temperature characteristic. Lead wires are attached using specially formulated solder and an encapsulant of epoxy or silicone resin is usually applied to the device for environmental protection. Most of the standard thermistors and RTDs located in our web site are available mounted in special probe housings designed for sensing temperature under the most demanding environmental conditions. U.S. Sensor's standard probe housings range in size from less than 0.020" diameter to over 0.375" diameter and are constructed from various materials including stainless steel, aluminum, epoxy, polyimide and PVC just to name a few. Detailed descriptions of some of U.S. Sensor's standard probe housings are shown in the product guide section of our website.